The Inupiat of Kaktovik, Alaska are subsistence hunters and are allowed to harvest three bowhead whales per year. This is practice is critical for the Inupiat village of Kaktovik. The meat, blubber and skin are shared among community members and are a source of nourishment throughout the winter. The whales are highly valued and there is very little waste. After processing, the bones are moved to the "bone pile" where the new bones are mixed with those from decades of previous harvests. The bears know of this place and begin to arrive in late August. They remain until the bones have been picked clean, or until the ice forms and they are able to hunt for seal. 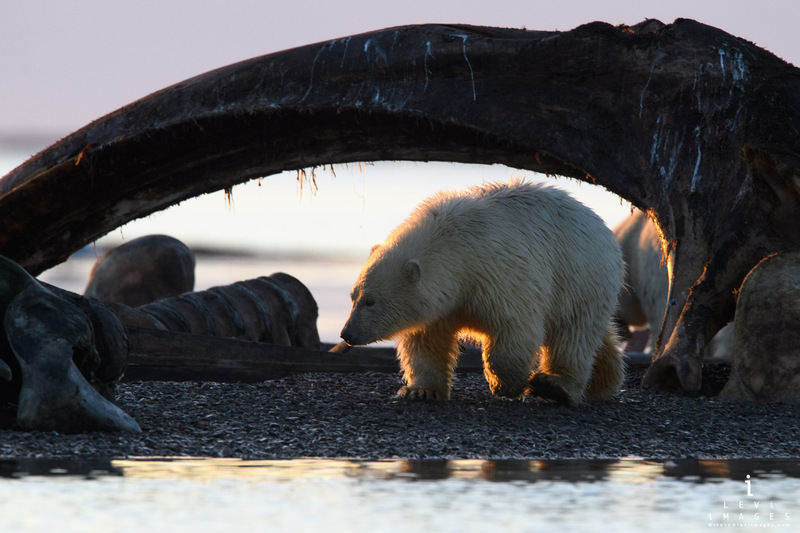 As twilight descends, a COY (Cub Of the Year) is framed by the maxillary bone of a bowhead whale.